On February 15, the book launch took place in Ankara in the famous Ankara Palace – the seat of the former President Mustafa Kemala Atatürk. Jozef Banáš has achieved another international success. His novel Jubilation Zone describing the dramatic events in Central Europe in the years between 1968 and 2008 has been released by one of the country´s five largest publishing houses Destek Istanbul under the title Behind The Curtain (Perde Arkasi). On February 15, the title was introduced to the Turkish book market, the launch taking place in the famous Ankara Palace – the seat of the former President Mustafa Kemala Atatürk. “The presentation was part of the festivities celebrating 25 years since the establishment of diplomatic relationships between Turkey and the Slovak Republic,” said Jozef Banáš. His book translated by the eminent diplomat and translator Assoc. 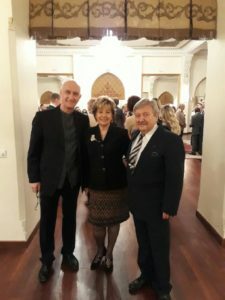 Prof. Dr. Umut Arik was introduced by the Ambassador of the Slovak Republic Anna Tureničová in the presence of diplomats, politicians, journalists and representatives of cultural institutions. Turkey thus joined the Czech Republic, Germany, Poland, Hungary, Russia, Ukraine, Bulgaria, Syria and India as the tenth country in which this most translated Slovak novel had been published. During his visit in Turkey, Jozef Banáš gave two presentations. He was invited by Prof. Dr. Kudret Bülbül, the Dean of Faculty of Political Sciences at the Ankara Yildirim Beyazit University, where he talked with students in a one-and-half-hour long discussion round.